I know the same argument could be made about women and their shoes but Darren only likes his denims in a dark wash. Although he has a huge collection of them and claims that they all fit differently, they all still look the same to me. Does your husband or significant other do the same? I can't even get my bf to go shopping...for anything new. So consider Darren a well-dresser! Those boots are the perfect color, too. Hi!! Just found your blog. Do you want to follow each other? Just let me know! Ha, ha....men, they are so strange about their jeans. My hubby sticks to 1 style/brand and that's it. Forget trying to talk him into anything else. Well, your man looks good girl and I totally loved your last outfit. SO jealous that you can layer with reckless abandon! Love the look! I would totally wear that sweater myself! Thats funny that you say that he sees them all differently, because I'm sure you have many multiples of a certain kind of clothing and see them all differently! Maybe even blue jeans! I agree though, I definitely prefer dark. I posted your blog on my reading list, I'm just starting out! I'm a fashion design student in Boston, and have been looking at your posts every once in a while. lease leave me a comment, follow me and then I will follow you back!!! For sure!! He has an amazing sense of style! Obviously, he is a style blogger's man!! When I saw your comment on my blog I was on the seventh heaven! Couldn't believe that the famous Khatu left me a comment!! I have always been a big fan of your style and your blog is one of those blogs that have inspired me to create my own blog! Thanks a ton for being such an inspiration! haha I'm actually the same with denim too! I have different washes, shades, cuts... oh man, I should stop hoarding jeans. fabulous style! 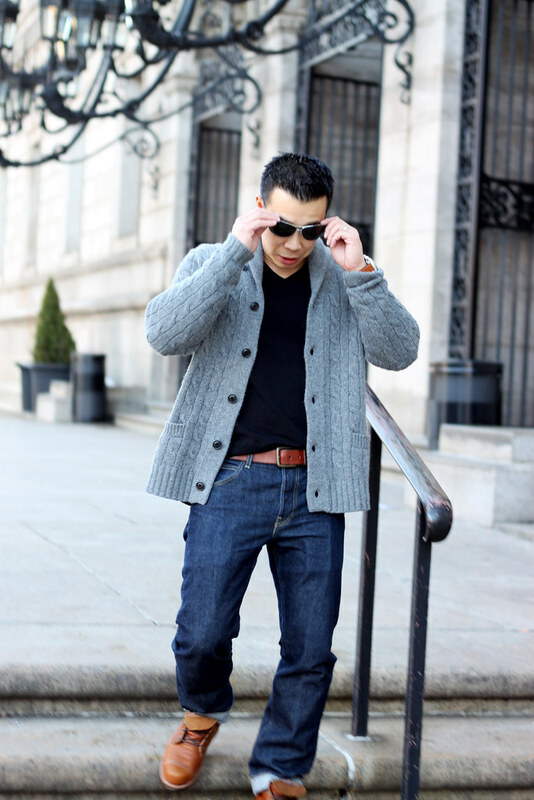 love the sweater, dark denim wash and his shoes. I think I can totally relate to him, my bf says all my "black shoes" are just that and they all look the same, when you and I know that absolutely not! He's got a great style! I loved your blog, thanks for leaving a comment on mine you are so sweet! Hilarious! 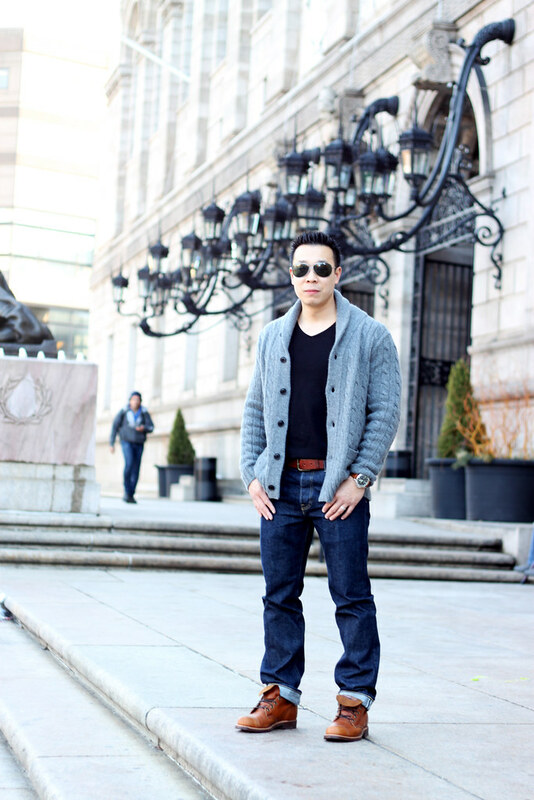 My boyfriend only wears the JCrew slim fit dark denim jeans! I have to admit I love how they look as well!! My hubby has like 10 pairs of the same jeans. He also buys multiple colors of the same 2 shirts... They all look the same to me! LOL. I love this post. My beau has 10 AG jeans and thinks they all look/fit different when I swear I bought him a few that are exactly the same cut, etc. One day I will throw the same jeans by his closet and see if he notices the difference when he puts it on! LOL. I love the sweater. What brand is it?